Fig 1. Studio Swine, Open Source Sea Chair 2013, ocean plastics. An example of Sea Chair that is fabricated on board the trawler. 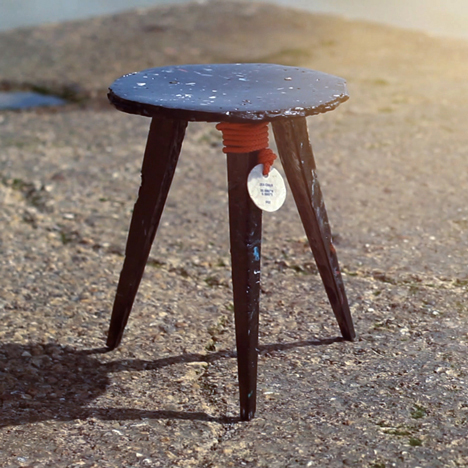 Studio Swine have developed a simple system that collects the plastic that is washed up on shore or caught in trawlers fishing nets to create the Open Source Sea Chair (see Fig 1. and Fig 2.). The chairs can be manufactured on board the trawler using a rudimentary furnace to melt the plastic down. The plastic is then put into steel moulds and once cooled the chair is assembled and finished with hand tools. 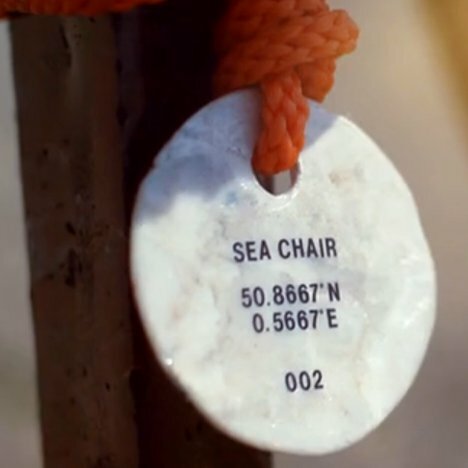 The chair tells a story of the state of our oceans and imparts a sense of journey and place, the discarded materials value is heighten through social and environmental awareness. Fig 2. Studio Swine, Open Source Sea Chair 2013, ocean plastics. Longitude and Latitude marker to communicate the location of where the plastic is collected. Thanks to the open sourcing of the simple tools and techniques plus the rapid manufacturing they have allowed anyone from around the globe to take up this method. It is imperative that I connect with community as this is the only way the system will have an impact, so open sourcing my system and product will be part of it. The product, although rudimentary, has a hand made aesthetic which my product needs to ensure the process and message isn't missed. Highlighting that this isn't just ordinary an ordinary product, it has a past and hopefully a useful future. "we shift from objects of primarily instrumental value, which are so easily discarded and replaced as needs and technologies change, to objects whose perceived value lies not just in their functionality but also in their inherent qualities as things – their history, aesthetics, and their enduring meanings, as embodied in their materials, making, use, and cultural or personal symbolism⁸." Both localised workmanship and the restorative nature of circular design can work in benefiting social, economic and environmental factors. ⁸Stuart Walker, Design for Life, Creating Meaning in a Distracted World (Abingdon, Oxon; New York, NY: Routledge, 2017), 82. Singh, Jagdeep. “Resource Recovery from Post-Consumer Waste” Journal of Cleaner Production 134, no.si (2016): 342. Fig 1. Bormann Anna, Reline Tableware 2010. Recycled crockery. As discussed in the paper, Bormann creates a cohesive tableware set from reclaimed, mismatched crockery with just the addition of a simple coloured line. The study’s findings propose that products utilizing materials from current waste management systems even though they are not establishing their own system of resource recovery, they are still successfully producing circular products. It shows rather than theorizes that products can sequester waste in continual loops by designing around the system already set and that effective use of waste management it can be considered a closed loop. Through analysis of the data Singh addresses how relying on waste management can be problematic which empowers me as a designer with the knowledge of prospective challenges at the beginning of designing around the system. Moreno, Mariale. “A conceptual Framework for Circular Design” Sustainability 8, no.9 (2016): 937, doi:10.3390/su8090937. This paper also recognizes the limitations of circular economy literature in that they provide little guidance for practical applications for new circular business models. The paper thus develops a conceptual framework for circular economy design strategies by linking current literature on Design for Sustainability and circular business models. 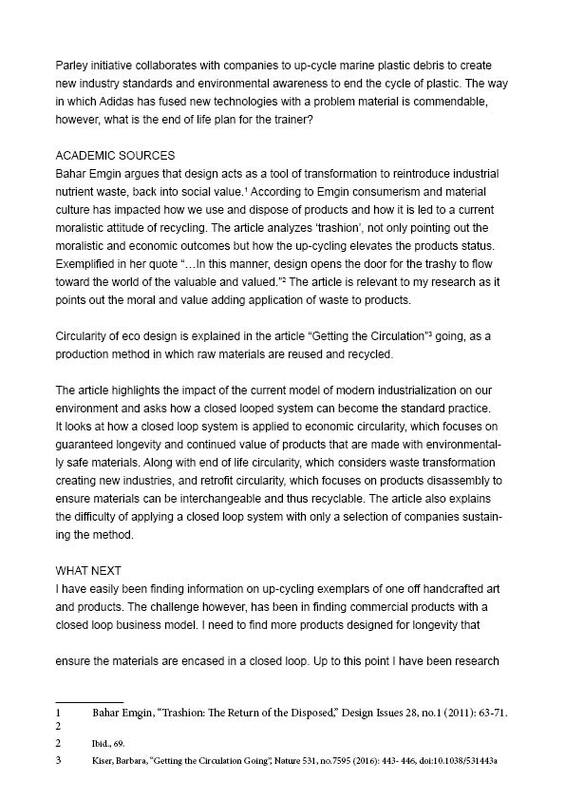 This paper discusses the usefulness of linking Design for Sustainability with circular design literature due to its practical implications in informing how circular design can work. The paper directly maps out a conceptual framework to inform practitioners in circular applications. This paper is an important resource to inform, not only to my research into different practitioners allowing me to classify their circular systems and their benefits, but also to my future experimentation. This paper concludes that circular design economies are realistic in implementing a restorative resource flow and provides a solution to the pandemic overflow of post-consumer waste into our environment. De Pauw, Ingrid C. “Comparing Biomimicry and Cradle to Cradle with Ecodesign: a case study of student design projects” Journal of Cleaner Production 78, no. 0959-6526 (2014): 174-183. This case study compares the results of 27 groups of students that designed a ‘sustainable product’ through specific criteria of biomimicry, cradle to cradle or eco-design strategies over a two-year period. In relation to my topic question the findings describes the cradle to cradle design approach as not only challenging designers to reduce a products impact but, benefit the environment which addressed the core of my topic. Both eco-design and the cradle to cradle results produced alternative materials and new forms, however, cradle to cradle more predominantly presented alternative ways to fulfil the product function and user needs focusing on product context (people, companies and circumstances interrelated to the product system). The study finds that the cradle to cradle strategy does not address quantitative evaluation tools that prevent unforeseen environmental impacts of the design during its life cycle. This source acknowledges cradle to cradle strengths and weaknesses and compares the strategic outcome in comparison with other frameworks, which helps determine if a closed loop system is the most beneficial use of post-consumer waste. This study would provide more insight if it was applied to real world products and designers. Nonetheless it provides an application of this strategy whereby practitioners may be incorporating eco-design into their product development to create a more successful result. Fig 1. Niell Brodie, Gyro Table 2016, ocean terrazzo (made from fragments of ocean plastics waste). Fig 2. Niell Brodie, Gyro Table 2016, ocean terrazzo (made from fragments of ocean plastics waste). The table was a one off commission for the London Design Biennale 2016, the process of which Neill hopes to industrialize. The question that has started arising is whether the products I am looking at are creating closed loops? So, has the Gyro Table created a closed loop? Issues around how the waste material is actually re-purposed arise in some of the literature found in my research, and discuss whether it is the best use of that material.2 In the case of The Gyro Table, it was produced by combining the plastic with resin, which eliminates the ability to recycle again. Even so the plastic was not used in the most pragmatic sense, it is now part of a work of art, it represents a catalyst for change in how we use and see waste plastics. By lifting the perceived value and aesthetic appeal of the material, Neill ensures the life of the plastic material within the use stage to be cherished and kept as piece of great design. Thus in my eyes, creating a circular system where by the plastic is released from the environment and will not return to the environment. 1 Rima Sabina Aouf, Brodie Neill Creates Terrazzo-Effect Table Using Recycled Ocean Plastics. Dezeen. Accessed August 19 2016. https://www.dezeen.com/2016/09/03/gyro-table-brodie-neill-recycled-ocean-plastic-first-london-design-biennale/. 2 Singh, Jagdeep. “Resource Recovery from Post-Consumer Waste” Journal of Cleaner Production 134, no.si (2016): 342. Fig 1. Dave Hakkens. 2016. Precious Plastics. Video. Precious Plastics (see Fig 1.) have produced opened sourced, low tech machinery that breaks down plastic goods for redesign on a small-scale level. This approach can be applied worldwide to utilize plastics found within the environment to create beneficial and useful objects. The application of this small-scale production is particularly beneficial for designers and artist. Injecting this perceived valueless material into handcrafted objects will ultimately impart a strong relationship between object and person. The small-scale factory also benefits developing countries that don't have established municipal waste management. Where waste is currently choking the environment, the plastic can become a free resource that creates revenue, creates practical goods for locals and intern cleans up the environment. The addition of a small-scale factory like this into a community could inspire people to either bring in their own waste plastic or free it from the environment. If the amount of plastic one sees by just going for a walk along the beach or park are to go by, our current plastic system is does not work. The New Plastics Economy is an initiative that is building momentum towards a plastics system that will. They are working towards applying the principal of a circular economy, and bringing together key stakeholders to rethink and redesign the future of plastics, starting with plastic packaging. Fig 1. NPEC. The New Plastics Economy (2016). video. As seen in the video (see Fig 1.) The New Plastics Economy do not discount the many benefits and innovations plastic provides, they alternatively highlight how the current "take, make, dispose" model fails and negatively impacts our environment . The linear model (see Fig 2.) is an extreme mishandling of this highly useful material. Which is further explained through alarming facts (see Fig 1. and Fig 3. ), globally, only 14% of plastics are collected for recycling and even more disturbing 1/3 of plastic packaging escapes collection and ends up in our environment . The plastic economy as it stands, is utterly complex and one entity cannot change the system alone. This makes collaboration, the key to The New Plastics Economy's circular approach (see Fig 4.). A collaborative approach is something that will also allow me to make a bigger impact with my resolved design. I would like to utilize waste plastics in my product either through collection from the environment or redirected from landfill, and will need the support of my local community either way. Kiser, Barbara. “Getting the Circulation Going”, Nature 531, no.7595 (2016): 443-446, doi:10.1038/531443a. Circularity of eco design is explained in the article “Getting the Circulation” going, as a production method in which raw materials are reused and recycled. The article highlights the impact of the current model of modern industrialization on our environment and asks how a closed looped system can become the standard practice. It looks at how a closed loop system is applied to economic circularity, which focuses on guaranteed longevity and continued value of products that are made with environmentally safe materials. Along with end of life circularity, which looks into waste transformation creating new industries, and retrofit circularity (see Fig 1. ), which focuses on products disassembly to ensure materials can be interchangeable and thus recyclable. The article also explains the difficulty of applying a closed loop system, with only a selection of companies sustaining the method. The principal of continual conservation of product and material also contradicts the capitalist method of continual continual sell, sell, sell. This article presents the need for a closed loop system and its clear potential, however begs the question of whether a closed loop approach is a realistic one. This article pushed me toward finding realistic frameworks for circular design and broadened my research scope into grass roots endeavours pushed by community dissatisfaction of current linear take-make-dispose systems. The Trent 1000 engine: Rolls-Royce has run a recycling program for more than a decade. Fig 1. Haygarth Stuart, Tail Light 2007, Vehicle tail lights, Perspex, fluorescent tube, H60cmx W51cm x D51cm. Tail light by Stuart Haygarth. Described in the article as an notable example of everyday object being successfully elevated to a designer object. Bahar Emgin argues that design acts as a tool of transformation to reintroduce industrial nutrient waste, back into social value.1 According to Emgin consumerism and material culture has impacted how we use and dispose of products and how it has led to a current moralistic attitude of recycling. The article analyzes ‘trashion’, not only pointing out the moralistic and economic outcomes but how the up-cycling elevates the products status. Exemplified in her quote “…In this manner, design opens the door for the trashy to flow toward the world of the valuable and valued.”2 The article is relevant to my research as it points out the moral and value adding application of waste to products. 1 Bahar Emgin, “Trashion: The Return of the Disposed,” Design Issues 28, no.1 (2011): 63-71. Adidas and Parley have created a concept trainer with the upper made from waste plastic filtered out of the oceans (see Fig 1.) and a 3D-printed midsole created from recycled fishing nets (see Fig 2.). Parley initiative collaborates with companies to up-cycle marine plastic debris to create new industry standards and environmental awareness to end the cycle of plastic. Fig 1. Adidas, Ultraboost trainer, 2016. Fig 2. Adidas, Ultraboost debris trainer, 2016. Fig 3. Adidas and Parley, From Threat to Thread, (2016) video. Adidas' simple yet effective film (see Fig 3.) exemplifying why we need to change the way plastic is used; by avoiding, collecting from our environment and reusing it. The film leaves us with the question "what if that was just the start? and what if everyone did that?". With this product, Adidas highlights how commercial ventures can make a positive impact on the plastic currently found in our oceans, and questions, what if this was the way in which all commercial products were produced? The way in which Adidas has fused new technologies with a problem material is commendable, however what is the end of life plan for the trainer? Is it enough just to use the waste plastic in another project only to find its way back into our environment or land fill, or have they missed the opportunity to close the loop of this material. Fig 1. Ikea unvieling of PS 2017 furniture and homewares, https://www.dezeen.com, Accessed March 23, 2017. https://www.dezeen.com/2016/06/16/ikea-ps-2017-collection-no-waste-products-furniture-recycled-materials-post-scriptum/. Fig 2. 'Kungsbacka' kitchen cabinet doors made from recycled PET plastic bottles and wood, https://www.dezeen.com, Accessed March 23, 2017. https://www.dezeen.com/2016/06/16/ikea-ps-2017-collection-no-waste-products-furniture-recycled-materials-post-scriptum/. Recently Ikea presented its Post Scriptim 2017 collection (see Fig 1. and Fig 2. ), which includes "no waste" products made from recycled materials. The products are geared toward young urban dwellers and represent an accessible price point. Ikea’s collection will inform my work as they have developed an economically realistic way of applying waste materials to production. The Products are also designed for longevity with the example of the kitchen cabinets expected to last 25 years. Fig 1. Duran, Alejandro. "Nubes (Clouds)" Washed Up Accessed August 17 2017. http://www.alejandroduran.com/. This photograph was taken as part of Duran's photography project "Washed Up" that transforms the international debris washing up on Mexico's Caribbean coast into aesthetic yet disquieting works. A culture of wasteful consumption has created an open-ended cycle of goods produced from finite natural resources and non-degradable byproducts. 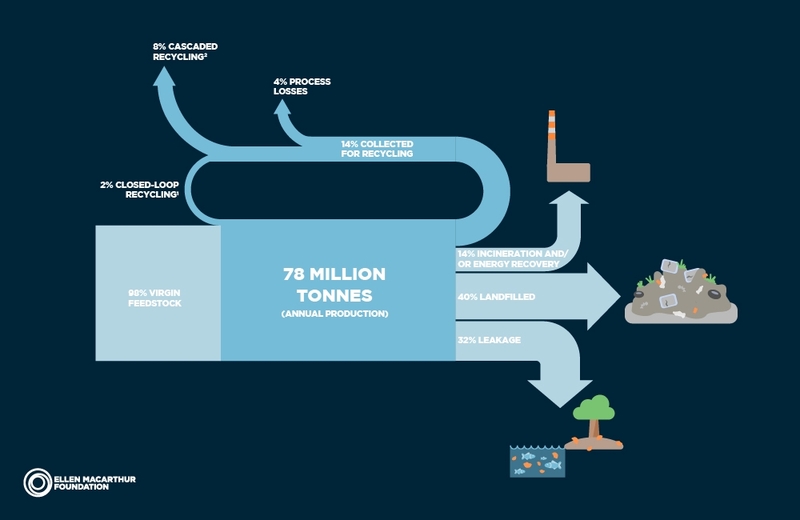 The method of extraction for these raw materials takes up a great amount of energy and precious resources, which negatively impact our surrounding environment. When we consider that most of these raw materials can be recycled saving in resources and environmental impact, why are we still so heavily reliant on raw material? With only a small percentage of products finding their way to recycling plants, a majority of products are discarded improperly, unnecessarily contributing to landfill and reeking havoc on our oceans and natural environment (see Fig 1). This is also giving false pretense to consumers who often believe the material will go back into manufacturing. Majority of industry currently views discarded raw materials, as a difficult resource to inject back into production. Equating the use of recycled materials to a costly and timely task that reduces product quality and consistency. Manufacturing companies are therefore perpetuating wasteful consumerism by not making products with recycled materials and designing for single use. "Can post-consumer waste create a commercially viable product that will sequester the material in continual recycling?" Action research is a method of addressing and responding to problems within our society and environment through practice in order to improve the human condition. It applies tacit (intuition) and explicit knowledge (your ability to explain things) to guide you through theory into praxis. The first part of my exploration will first be to address a need, and then frame this topic into a question (question will be subject to change as I work through my research) to explore further through academic journals regarding the situation and exemplar pieces and designers working in the field. The second part of this method is setting up to solve this problem through my design practice, to hopefully answer this question with a resolved design. This process is about reflecting, evaluating and improving.